The new navigation bar is slowly rolled out to all Google users. After more than 6 months of testing, the new navigation bar removes the clutter by grouping extraneous links in a menu inspired by Google Chrome. It also removes link underlining and replaces it with a colored bar. There's more spacing between the links, so the new navigation bar works better on a touchscreen device. Another change is that Google shows your name instead of your email address. For some reason, Google doesn't link to the Google Profile and makes it more difficult to switch to a different account if you use multiple sign-in or Gmail delegation. Now you need to click "Switch account" to see the list of accounts you can use. Unfortunately, Google didn't manage to add the bar to all its services, so you'll only see it if you use Google Web Search, Google Image Search, Google Realtime Search, Google Maps and Gmail. 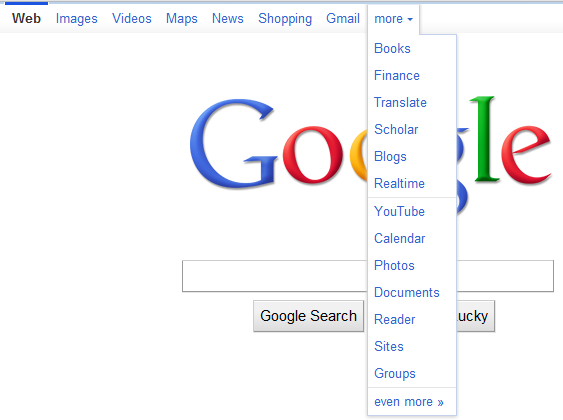 The non-integration with Google Profiles certainly is perplexing. No Google Docs and Google Reader? I wish it was customisable, or at least you would have a few spare link spaces which could have whatever you wanted. I want to customize the links! google docs just got the new nav bar..
Now it takes two clicks to sign out? Two thumbs down, usability of those features got 100% poorer. How often do you sign out? How often do you switch to a different account? An annoying side-effect of this change is that it's hard to tell which account you're currently using. If you sign in to multiple accounts and you use the same name for all your accounts, it's not that easy to distinguish the accounts. Maybe a profile image or a different color next to your name would solve this problem. the color of the bar is quite disagreeable with my gmail background. why can't i customize the links? or why not prioritize them by the ones i click on most. cz im romanian and i dont have it. is a a link or something if it i want it ok.
@Alex: Yep, I have multiple sign-ins enabled and in the new bar, it takes three clicks to do when in the old bar only two two clicks. Now you have to first click on your name, then on Switch account, and finally click on the account you want to log in to. Before, it was just clicking on your email address logged into and then on the account switching to. I got the new bar last night, but I can't say if I'm either excited by it or not. It looks good, an I have always like the design, still wondering when us poor UK web users will get access to it. the majotiry of people have 1024x768. dont fit in the scren too many services. Wow, sounds like they really made it worse. The worst part though is that they still don't allow it to be customized. I'm assuming this is because they want to have sufficient control to promote certain services through that bar, but the cost in usability for medium and advanced users is pretty big. I like the look of the "Switch profiles" screen, though. Booo... they made it worse. Hate the new "Switch Account" link. How do I get the old one back!? Who do I complain to? So many people just whine and whine. It's so annoying to read. How entitled do you all feel? It's pathetic. 3 clicks to switch accounts instead of 2?? OH MY GOD, THE HORROR!!!!!! Pathetic. Use the .co.uk domain for now to get the old bar back. I don't want my full name showing in large type at the top of my Gmail page. Is there any way to change it to show my email address? so when should we expect to hear about this in the news...ya know, a new security issue. I just heard a bunch of students talking about how they all were reading each others emails and sending emails to and from each other under different friend's accounts. good job google..another lawsuit in the making. I'm seeing the new nav bar in every service. Seems like they have been slowly releasing it in each service over the past couple days. It also seems that some services show the email address while others show the name. One big problem with this: in gmail, I no longer have a "Manage this domain" link, anywhere in the UI. OK, now I see it. They have an orphaned link on the far right side. Obviously they couldn't figure out where to put this in the new navbar, so they just stuck it over there by itself. had in in the netherlands, came back to germany and it was gone! 1) Double-click sign out is a hassle. This is not complaining, it is fact. Many people (myself included) find it a necessary practice to sign out often. 2) I am not interested in having my name displayed for everyone to see. I don't need Google to tell me my name. I do need to know which account I am in and I much prefer to not bleed time for that information. The interface looks better, but the usability and security changes cause a large negative net effect on my user experience. I don't want my full name showing in large type at the top of my Gmail page. When I'm in a public place (bus, subway, airplane, etc), I do NOT want my name to be prominently displayed. PLEASE let me have some privacy. How can I opt out of this new setup? Perfect, but dont working google turkish, so never mind..
Where is the sign-out ? Looks like google doesn't want its users to sign out ever..
1) I hate like the double click signout. Any people with more than one account need to sign out often. 2) I need to know the account I'm in, not my name. 3) I do prefer the old navbar. I get the new nav bar in both my Education and Standard edition Apps accounts, but only from my office, never from home. After some testing I found that I only get it if I'm connected to Google via IPv6, never via IPv4. Does anyone else have the same experience? +1 in not showing my name-as somebody already said, I do know what my name is. +1 I like the new bar, but it could be greatly improved if added the first two options. i clicked a hundred times and it really doesn't work at all... tsk-tsk-tsk! At work I have the new navigation bar...at home in my pc...no! I refreshed, cleared the cache, tried with Firefox and Chrome, but apparently my pc doesn't like the new navigation bar and it shows the old one! Why do I see new navigation bar in Firefox, but not in Chrome? That blue bar is intentional? I thought there had been some CSS failure. Wouldn't highlighting the current app similar to the mouseover highlighting look a little less....mistake-y? I'm with other commenters. I know my name, and I would like to see which account I'm currently using instead. I have the new nav bar in Firefox but not in Chrome as well. What gives? Same as Freddy G. but only on Windows. On Ubuntu, I have it on both FF and Chrome! I have been forced to use this new navigation bar for more than 2 weeks in chrome, and it's awful that I can't use the Gmail delegation feature any longer. As it doesn't display the other delegated account under "switch account" window. Anyone figured it out how to fix it? thanks. @Freddy G., @Tibi: Having your google.com preference set up to "google.com" might help to resolve the issue. 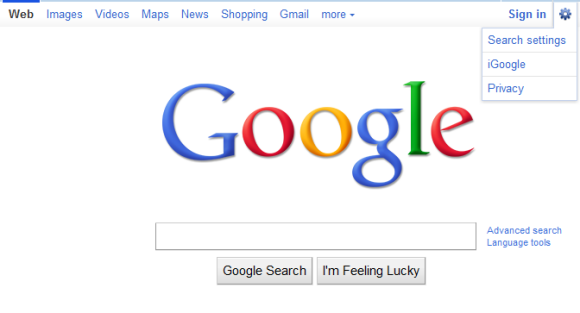 For example: you live in UK, beside "About Google" you have a link to "Go to google.com", click on it. The link changes in "Go to Google UK" and the new navigation bar should be there. I still got the old sign out bar on gmail when I use one of my computers. Does anyone know why that is? I'm not a big fan because it wastes more vertical space than the old one. Vertical pixels are very valuable on widescreen laptops and netbooks. In Google Docs, I want to see more document not more nav bar! Still, I can appreciate the need to be touchscreen-friendly and I guess a few pixels isn't all that much. The ugly thin blue strip on the top portion of the toolbar is hard on the eyes and now I have to click so many times to sign in/out of only one gmail account. My other gamil accounts have not been afflicted with this hideous toolbar - yet. If Google does not get this thing off my account I will have no use foe them anymore. Disappointed! Works on my laptop (Windows 7) but not on my desktop (Windows XP). Why? doesn't appear in all accounts. not sure why. What is the timeframe for the broad rollout? Do I need to add the button to my website? New navigation bar is not working in ie9. The new bar is really annoying and un-usable; now every link is more difficult to find and needs more clicks! +1 is there n really love it !!! Google has really workd hrd on this.. n final results were rocking ! I'm not a big fan because it wastes more vertical space than the old one.